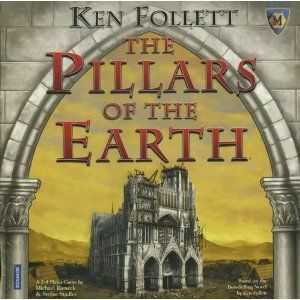 The Basics: Years ago, Pillars of the Earth by Ken Follett was adapted into a rather disappointing miniseries and a surprisingly good Euro boardgame published by Mayfair Games. Ranked at #130 on the BGG listings, which is above Kingsburg, Elysium, and even the venerable Settlers of Catan, Pillars combines good old fashioned marketplace confrontation and worker placement for a perfectly decent if unremarkable euro. Simply put, players compete with each other to gather materials with which to build the cathedral and then set their stable of artisans to work building little bits and pieces of the cathedral, thereby earning victory points. The game ends after six rounds and the player who has contributed the most to the cathedral–that is, gotten the most victory points–wins. Although less than ten years old, this game already feels a little dated and its primary distinguishing characteristic seems to be that it can seat six players with an expansion. I say this because, suspiciously, my group only ever seems to break it out when we have a group of six people–nobody ever seems to ask for it with fewer the same way they ask for Terra Mystica or Caverna: the Cave Farmers. Does this mean it’s a bad game? No, it just feels like the world has left it behind. It is also worth saying that good euros that can seat six players are not terribly common, so the capacity to seat six is a notable feature. What we did wrong: It’s funny, I’ve been playing this game with various groups for years (though only sporadically). Imagine my surprise at learning only last week that players can keep only five resources between turns. This small but extremely important rule isn’t noted prominently anywhere one might expect to find it–it’s not in section of the rules on ending a turn or the rules about resources, but is noted randomly at the beginning of the rulebook. In fact, the group I was playing with would have missed it entirely had it not been mentioned on an event card. This rule is important because players will otherwise float big piles of resources from turn to turn and wait until a very powerful artisan card fall their way allowing them to convert their banked resources into large amounts of victory points. The five resource cap removes this problem. Conclusion: I’m going to blame this screw-up on a flaw in the rulebook rather than player incompetence. As for the game, Pillars of the Earth is an admirable design but a little dated by recent worker placement games like Tzol’kin or Caverna. However, the game is still worth a look if you’re a fan the novel or want a light euro for a larger group.